Artist Invader has a theme: Space Invaders. 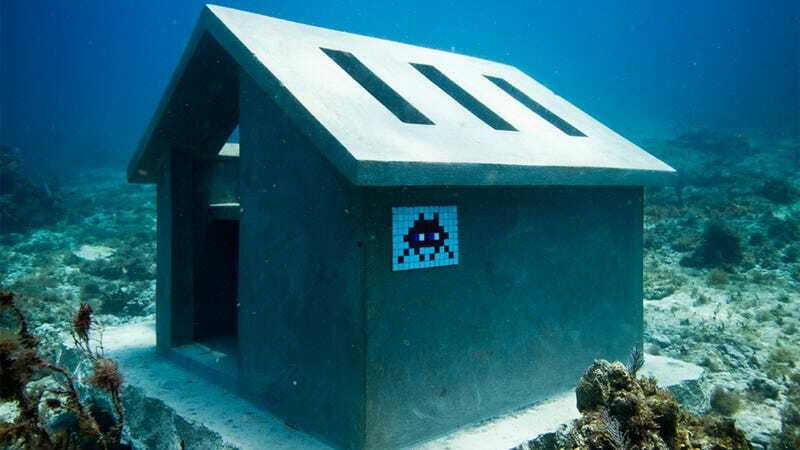 His homages to the little 8-bit enemies show up all over the world, on art and loose in wild, showing up in all manner of places where one might not ordinarily expect them. In this case, he went to the Bay of Cancun, where sculptor Jason Taylor deCaires had a number of submerged sculptures. The result? Cheerful little Space Invaders, only now, I suppose, they must be Ocean Invaders. I suppose they're like the Spanish Inquisition, really: nobody expects them. And yet, there they are.